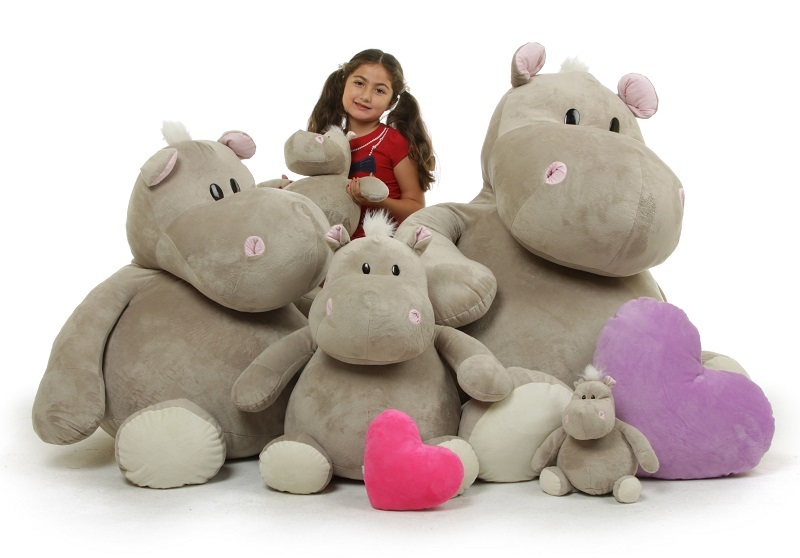 Kili Kubu 29 inch Oldest Daughter Of The Kubu Stuffed Hippo Pod, A Sweet Plush Hippo! Kili Kubu is the oldest plush hippo calf and big sister of the Kubu stuffed hippo pod. She is about 7 years old, and the smartest student in stuffed hippo school. Kili loves her pink Kubu family hoodiet, she wears it all the time. She tries her best to guide her younger brother and sister with her infinite 7 year old wisdom, but she knows that everything goes through one ear and out the other with them, so she watches over them, just like her mother. Kili isn't the smallest or biggest stuffed hippo in the Kubu family. She is right in the middle, standing at just under 2 1/2 feet and sitting just over 1 1/2 feet tall. Kili is the perfect plush hippo toy small enough to bring into bed and big enough to play with during the day. I give a large stuffed animal to my grandbabies on the day they are born. I was specifically looking for a large cute hippo for my granddaughter due any day and I found this one. It arrived in just three days and is cuter than the picture. I added a pink bow to her scruff of hair and now it is absolutely adorable! SUPER CUTE - LOVED IT!!! At Thanksgiving my husband, who's 60, he starting singing "I want a hippopotamus for Christmas" My niece thought that was the funniest thing and decided "Prince needed one, but not a real one cause those are hard to take care of you know." It left her mind after a few days and resurfaced a week before Christmas. I did a search and found Kili. Just what we needed! Although I was all for ordering the largest one, but wasn't quiet sure how my husband was going to react. We personalized the card, had the big box all wrapped up and under the tree. My niece fell in love with it and so did her uncle. Kili is so super soft and cuddly. She's found her home up on top of the bed. Our 3 labs also love her and try to sneak her out and about on occasion. I'm so glad I ordered this, it was delivered on Christmas Eve morning and was the hit of our Christmas Eve gifts. Who knows, we may end up ordering Kubu.